to study art at the Berlin Academy and embarked upon a bright career in Weimar Germany. Born in Preussisch-Holland, a small town in Eastern Prussia, in 1898, Lotte Laserstein was the eldest daughter of pharmacist Hugo Laserstein and his wife Meta, née Birnbaum, a piano teacher. After the early death of her father, her mother moved with her and her sister Käthe to their widowed grandmother in Danzig. Being from a bourgeois Jewish family, Lotte later remarked she was raised with “no religion.” Ten years old, she received her first drawing lessons from her aunt Elsa Birnbaum, who ran a private painting school. In 1912, the family moved to Berlin. Six years later, Laserstein enrolled at Berlin’s Friedrich Wilhelm University, to study Philosophy and History of Art. From 1921 to 1927, she attended the Berlin Academy of Fine Arts where she was one of the first women to complete her master studies. 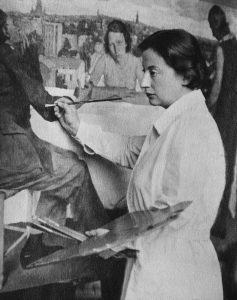 From 1928 to 1931, Lotte Laserstein participated in 22 exhibitions and performed well in various competitions. In the course of the Prussian Academy of Arts’ spring exhibition in 1928, she sold her painting In the Tavern to the Berlin City Council. That same year, Laserstein participated in the competition “The Most Beautiful German Portrait of a Woman” organized by the cosmetics company Elida in cooperation with the Reich Association of Visual Artists. 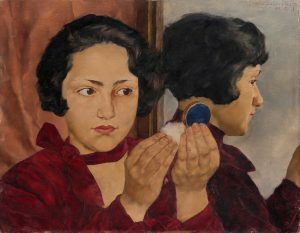 Out of the 365 works submitted, her painting Russian Girl with Compact, now in the collection of the Städel Museum, was nominated for the final round and exhibited together with twenty-five works by almost exclusively male artists in the prestigious gallery of Fritz Gurlitt in Berlin, where Laserstein’s first solo exhibition also took place in 1931. After the National Socialists seized power, Laserstein’s nascent career ended abruptly. She was declared a ‘three-quarters Jew’ and no longer able to exhibit. Her painting In the Tavern was confiscated as “degenerate art.” Dismissed from the board of the Association of Berlin Women Artists, she could present her works only within the frameworks of the Kulturbund Deutscher Juden (Cultural League of German Jews). She had to close her private teaching studio and depended on friends to buy her paint and materials while working as an art teacher at a private Jewish school. An exhibition at the Galerie Moderne in Stockholm in 1937 offered her the opportunity to leave Germany, taking many of her paintings with her. To obtain Swedish citizenship, Lotte Laserstein married Sven Marcus pro forma, but never lived with him. Laserstein died in 1993 at the age of 94 in the southern Swedish town of Kalmar. She never returned to Germany. Berlin acquired her monumental key work Evening over Potsdam from 1930. Laserstein’s oeuvre is one of the great recent art historical rediscoveries, featuring sensitive and compelling portraits from the final years of the Weimar Republic. This fall, the Städel Museum in Frankfurt am Main presents the artist’s first solo exhibition in Germany outside of Berlin. “Lotte Laserstein. Face to Face” builds upon works from the collection of the museum, which in the past few years was successful in acquiring important works by the artist. With approximately forty paintings and drawings, the exhibition focuses on Laserstein’s artistic development. Emphasis is placed on works from the 1920s and 30s, which mark the peak of her artistic activity. In her portraits on show in Frankfurt, Laserstein brilliantly depicts the people of the interwar period, such as in Girl Lying on Blue (1931) or The Mongolian (1927), whereby her works are characterized by sobriety, modernity and psychological depth. In her oeuvre, there are also motifs that speak of the enthusiasm of the time for technology and sports, although these are much fewer in number. In her portraits, Laserstein paints types from modern everyday life: athletic women, young girls putting on make-up, a motorcyclist in full gear and fashionably dressed city dwellers. Her masterpiece Evening over Potsdam is also included in the Frankfurt exhibition. The seven foot long 1930 painting shows five young people sharing a meal on their terrace, with Potsdam’s skyline arrayed in the far distance. The preparations for this picture were elaborate, as her model Traute recalled: “The very long canvas was first transported to Potsdam on the Berlin railway, and then by horse-drawn carriage to its destination with friends who had a roof garden overlooking Potsdam.” The mood is pensive with something melancholic about it. “Face to Face” confirms Lotte Laserstein’s reputation as one of the Weimar Republic’s outstanding woman artists. After its launch at the Städel Museum in Frankfurt am Main, the exhibition will travel to the Berlinische Galerie, where it will be complemented with, among others, works created by Lotte Laserstein while in exile.